Saturday was boiling hot. The “Real Feel” temperature when I left to work out was 108°. It was not a day for baking or watching over bubbling pots on the stove. No, something cool and pretty for dinner was in order and while dinner was being assembled one hand needed to be occupied with a cold summer cocktail. I didn’t want anything processed…y’all know that ain’t me, babe. I wanted something cool and easy but substantial and rich in flavor. I had almost all the ingredients on hand and most were already prepared. Lemons, shelled pistachios, fresh thyme, garlic and whole grain bread are always to be found in my kitchen. There’s about a 95% chance you’ll almost always find fig preserves in my refrigerator. The only thing I had to prepare was the ricotta. For lasagne I’ll buy store-bought but for a dish more delicate I make my own. I want the ricotta to sing with freshness AND it’s easier than getting in the car and driving to and from the store. Here’s my summer secret. It’s made in the microwave. Isn’t that great? No hot kitchen. 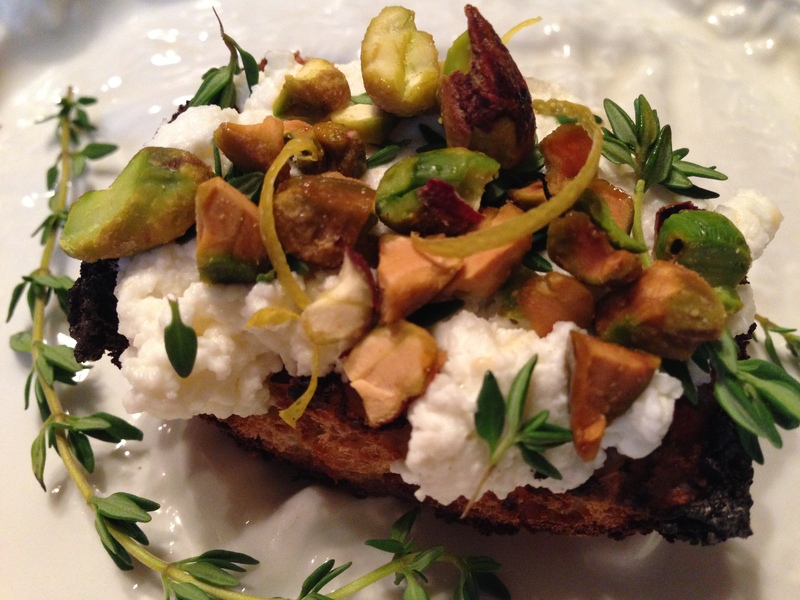 I’m going to post the recipe for homemade ricotta below but before I do let me tell you how I served it. Lightly toast your bread and let it cool to room temperature. Run a peeled clove of fresh garlic over the top side of each piece. Sprinkle a little salt and pepper over each, slather each slice with a thick coating of ricotta and cut into serving sized hunks. This is where they became different. On some I lightly pressed in shelled, salted, roughly chopped pistachios. Over that I sprinkled fresh thyme leaves and a bit of fresh lemon zest. Oh, man. They were divine. On the others, over the ricotta, I spread a layer of caramelized onions, (I try to always have a jar in the refrigerator), a generous dollop of store-bought fig preserves and a light scattering of lemon zest. 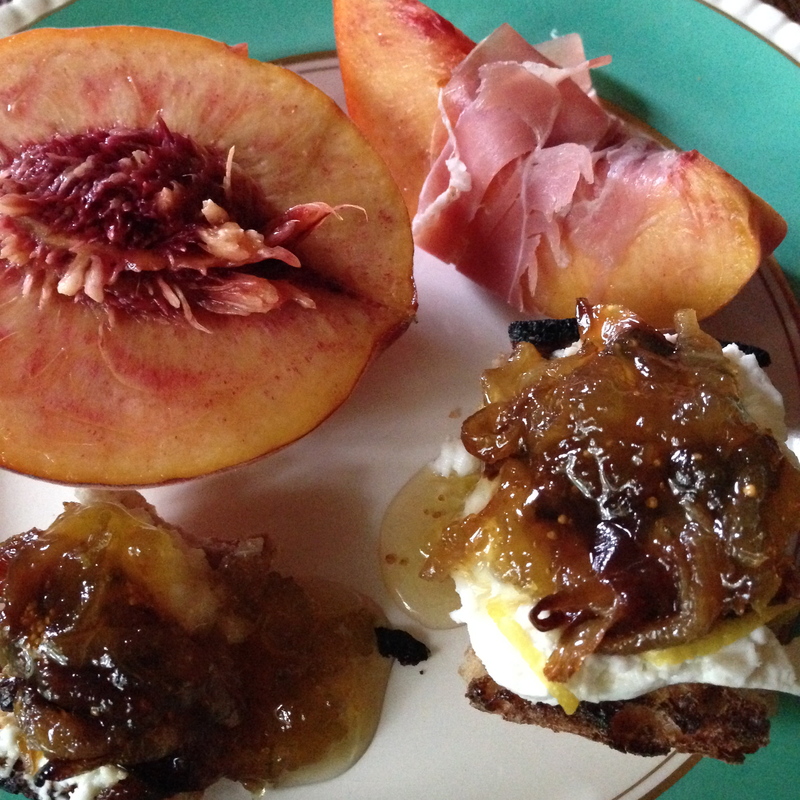 These were served on a large tray with juicy slices of peaches each wrapped with a pretty ribbon of domestic prosciutto. Oh my gosh, the sweet and salty of it all. It doesn’t get much easier. It’s a meal that’s light but satisfying and pleasing to the eye. If you make your ricotta on Thursday or Friday you’re really ahead of the game. So go ahead, pour that second drink and get back in the pool. It’s hot! Place all the ingredients in a glass or non-reactive bowl in the microwave. Heat on high in 5 minute increments. Do not stir. Keep your eye on the milk to avoid boil-overs. Line a large plastic or non-reactive colander with several layers of cheesecloth, (buy it at any grocery store), and place the colander in the sink where it can drain. When the white curds have separated from the whey carefully remove the bowl from the microwave. The whey is the watery stuff on the bottom and the ricotta is the thick, white layer on top. Gently spoon the curds into the colander and when the bowl is cooler to handle continue by pouring all the remaining cheese and whey into the colander. The longer it sits and drains the thicker the cheese will be. Done!